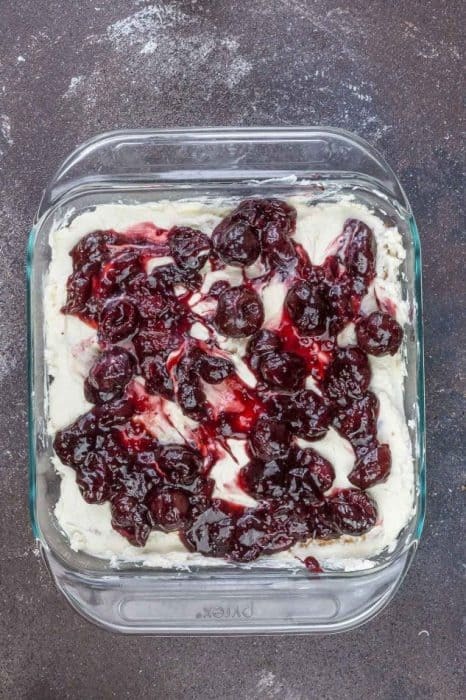 No Bake Cherry Cheesecake Icebox Cake is the perfect easy dessert for summer. 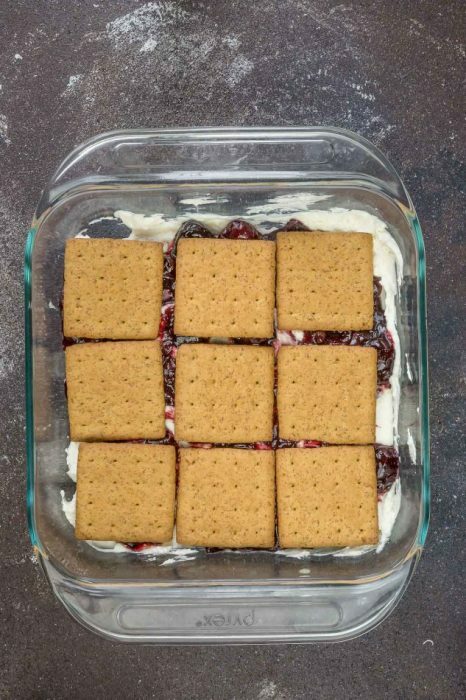 Best of all, this recipe only requires 5 ingredients – cream cheese, heavy cream, powdered sugar, graham crackers and homemade or canned cherry pie filling. Great for making ahead for parties, potlucks and barbecues! Plus recipe video. 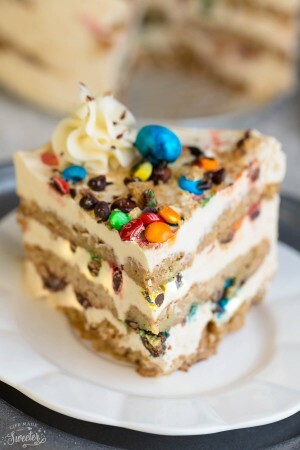 I don’t know what it is about icebox cakes but I just can’t seem to stop my obsession with them. They are just too darn easy to make and with this heat, you can have a creamy and dreamy dessert without having to turn on the oven. 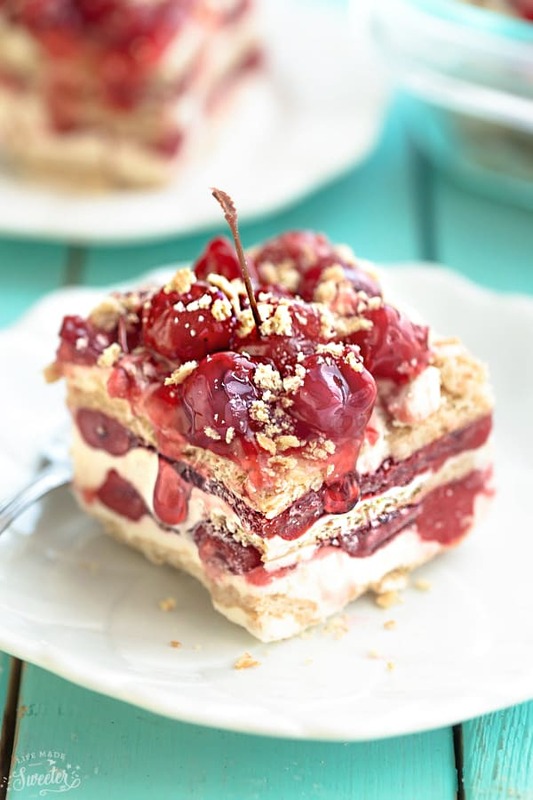 Cherry Cheesecake is such a popular dessert but it can take some time and planning to make. 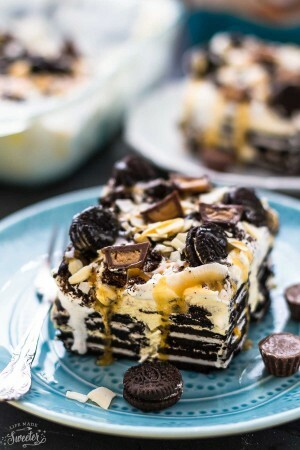 This easy icebox cake version combines all those delicious flavors but takes only a fraction of the time with just 5 ingredients! It starts off the same with a layer of graham crackers. Then you whip together some cream cheese, heavy cream and powdered sugar and spread that over evenly. 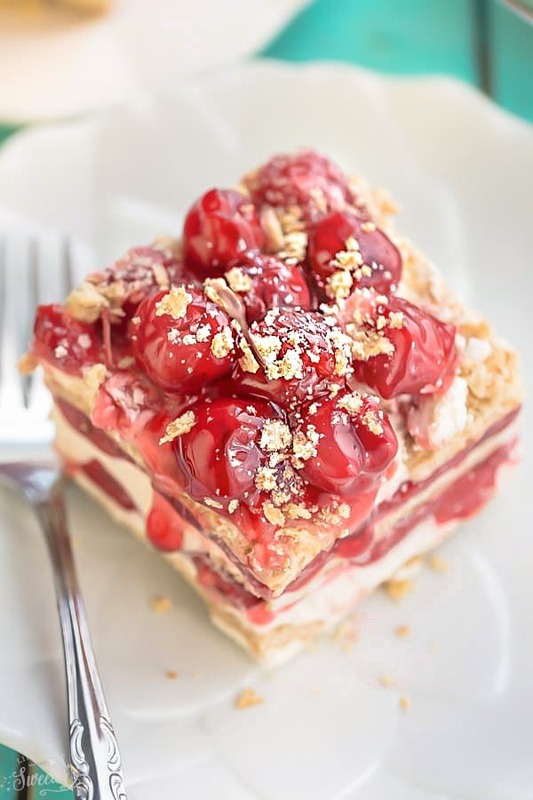 A generous spoonful of your favorite cherry pie filling (homemade or canned – I made two versions with each) comes next and then you just repeat the layers. 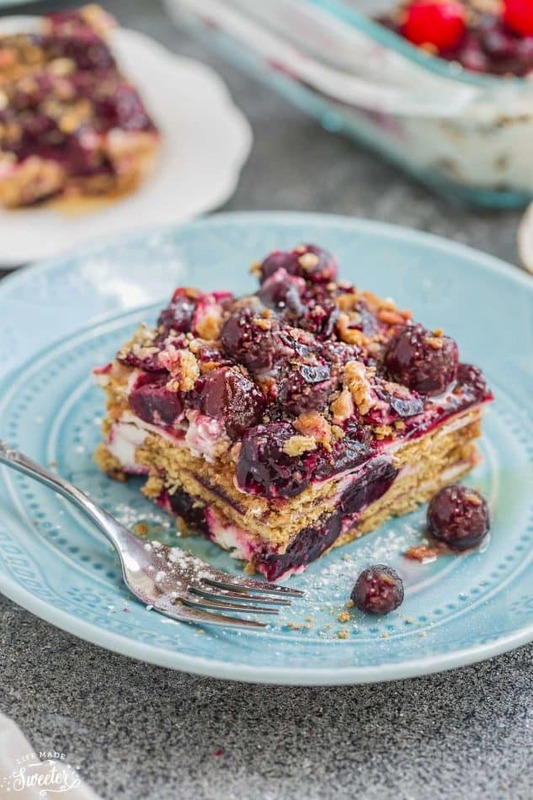 The topping is just more cherry pie filling and crumbled graham cracker crumbs. You can get super fancy and add some drizzled chocolate or toasted crushed nuts if you’re a fan but I decided to keep it nice and simple. 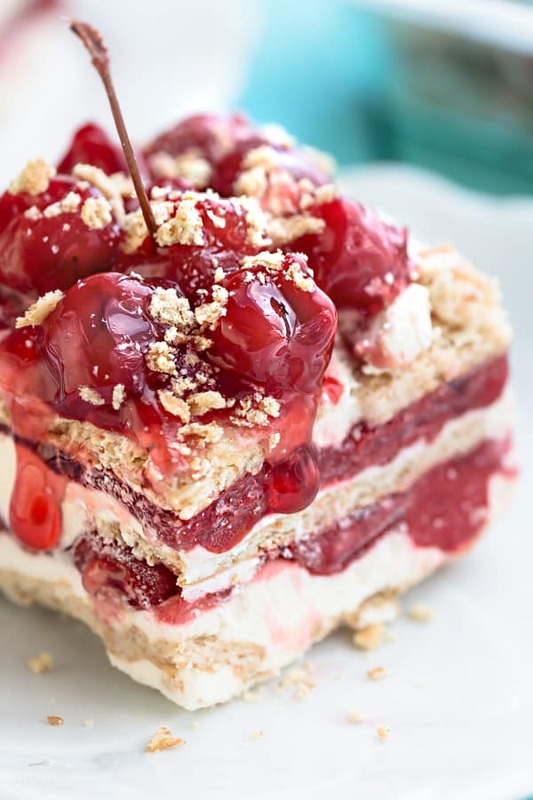 This dessert is just like having a cherry cheesecake without the hassle of turning on your oven. It’s cool, creamy and completely irresistible. 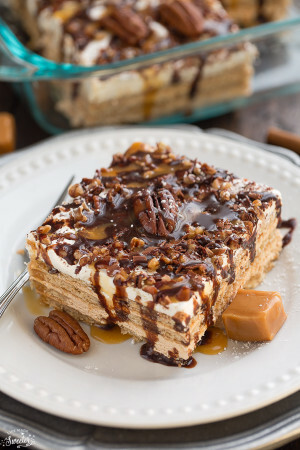 Plus icebox cakes are perfect for making ahead of time the night before and they make amazing desserts at potlucks, holiday gatherings and barbecues. And even though I can already feel fall is creeping its way around the corner, I am still trying to hang on to summer just a little bit longer. Plus since this dessert is made with cherry pie filling, it’s so convenient to make this all year long. 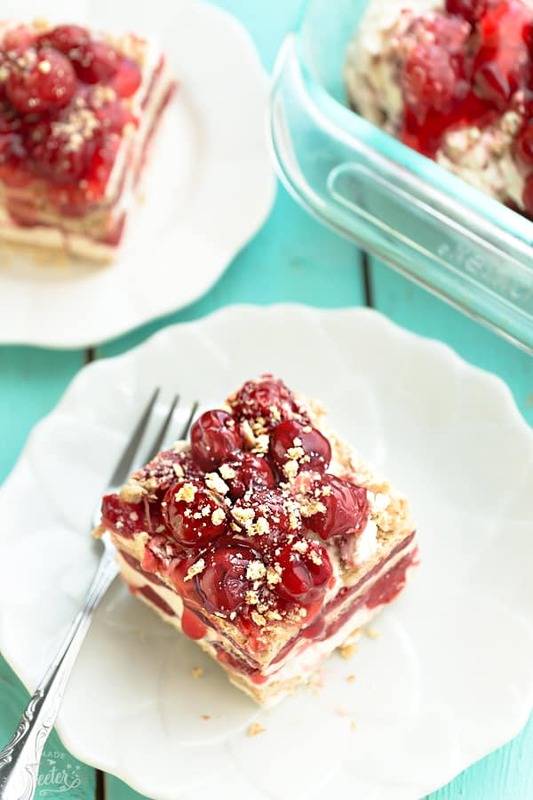 No Bake Cherry Cheesecake Icebox Cake + VIDEO! 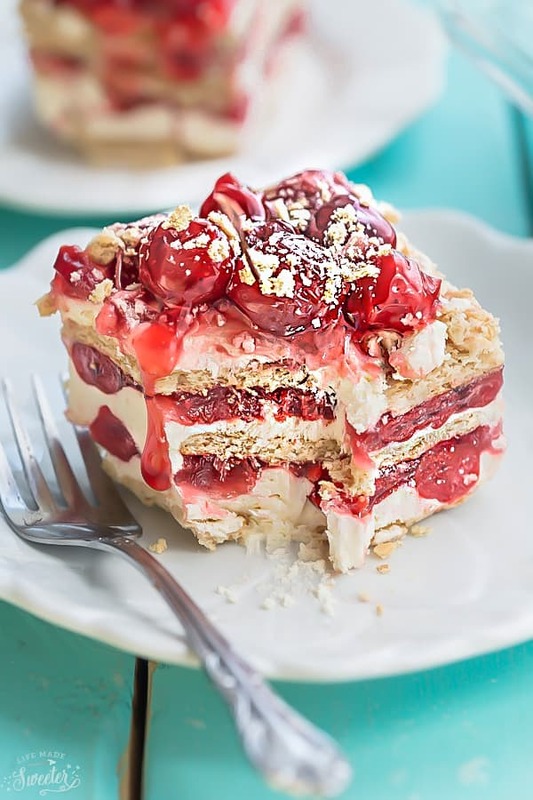 Cherry Cheesecake Icebox Cake makes a cool and creamy dessert and perfect for making ahead for summer parties, potlucks and barbecues! To make freshly whipped cream: With a hand mixer or in the bowl of a stand mixer, whip 2 cups of heavy cream until it just holds soft peaks. Add 1/3 cup of powdered sugar, 1/2 teaspoon of vanilla extract (optional) and whip to combine until stiff peaks hold. Do not overmix. Set aside 1/2 cup whipped cream for topping. In a separate large bowl, beat the cream cheese until smooth. Fold in the 3 cups of whipped cream or Cool Whip. 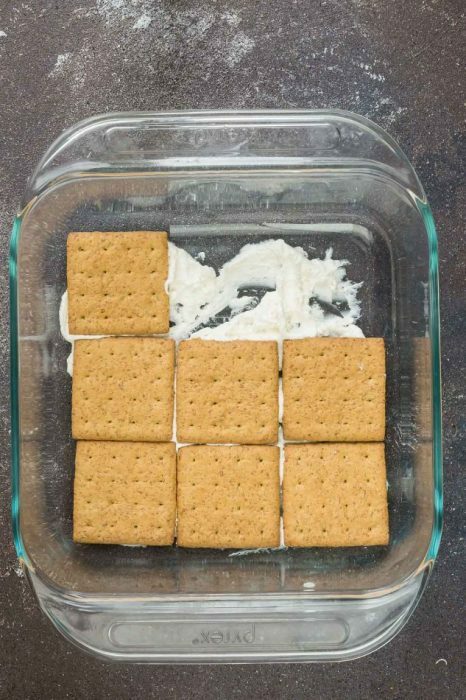 Place 3 graham crackers across the center of pan and then break up 1 or 2 more crackers as needed to fill in the gaps. Spread half of the cream mixture on top. Spoon an even layer of cherry pie filling and spread. Top with another layer of graham crackers, breaking them as needed to make them fit. Spread the remaining cream mixture over top. Add another layer of cherry pie filling. Arrange the last layer of the cherry pie filling evenly. Sprinkle on graham cracker crumbs on top. In a saucepan over medium heat, simmer cherries (stirring often) for 10 to 15 minutes, until they release their juices. Whisk in honey or sugar until dissolved. In a separate bowl, whisk together cornstarch with water until smooth and whisk into the saucepan. Turn heat to medium high and cook until the filling has thickened, about 2 minutes; remove from heat, let cool, and use as pie filling. 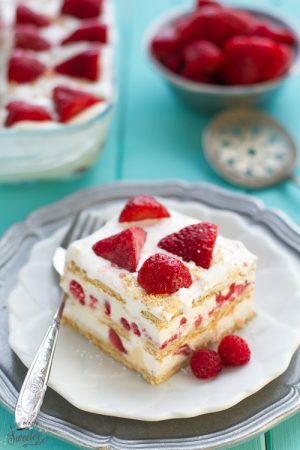 *To make this icebox cake in a 9x13 pan, increase the amounts by 1.5 *You can replace cream cheese with prepared cheesecake pudding or vanilla pudding if desired.. Just mix in with the 3 cups of whipped cream.